Sculptor, painter and architect Andrea di Cione, better known Orcagna was born in Florence, the son of a goldsmith (c. 1308-c.1368) and studied with Andrea Pisano, and went on to join both the guilds of painters and sculptures. He dominated the mid 14th century art scene in Florence and beyond, although he was greatly disparaged by Vasari, who left him out of his Lives of the Artists and destroyed much of his work. He often worked alongside his brothers, Jacopo and Nardo di Cione, but was so admired that he was called'Orcagna', Florentine slang for 'Archangel'. 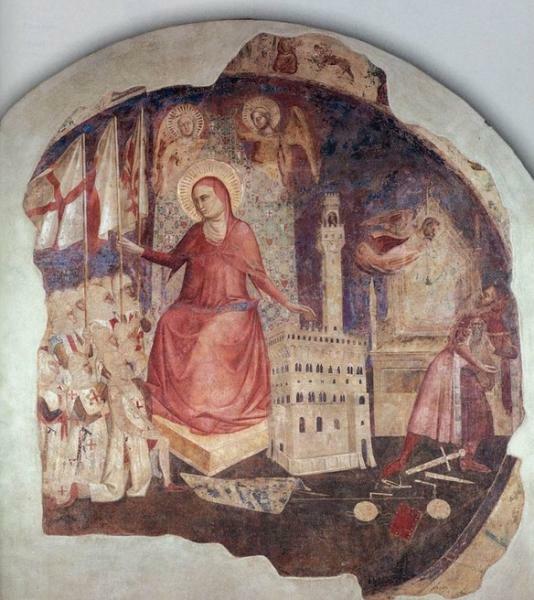 But Orcagna's surviving works are a testimony to his range and power: the stunning tabernacle in Orsanmichele, his only certain work as a sculptor; the damaged frescoes on the Triumph of Death, Last Judgement, and Hell in Santa Croce, the altarpiece of the The Redeemer with the Madonna and Saints (1354-57) in the Cappella Strozzi in Santa Maria Novella, the Crucifixion and Cenacolo in refectory of Santo Spirito (now the Fondazione Salvatore Romano), also often given credit for the design of the Loggia dei Lanzi. He fell ill while painting the altarpiece of St Matthew (now in the Uffizi), which was completed by his brother Jacopo di Cione. Outside of Florence, Orcagna was appointed Master of Works at Orvieto Cathedral, and is credited with its rose window and mosaic designs. Many believe he is the remarkable ‘Master of the Triumph of Death’ in Pisa’s Camposanto.